I ordered a new seat back cushion for my 140, as the old one was toast. Looking at pics of different year 140's online I see there was a change made to the seat frame at some point in the way the back cushion is mounted. On my seat frame there's only one hole per side in the metal tabs the seat back bolts to. Some pics of other 140's show the metal seat frame tabs with 2 holes per side. My old seat cushion and the new ones I've found all have 4 holes in their backside for mounting........ie, 2 holes per side, but the part illustration in the 140 parts book shows only one hole per side. I compared the seat frame and cushion to that of the Cub's deluxe seat. The frame number is different because the seat in the 140 slides for adjustment, but the rear cushion number is the same as the Cub's. The Cub's seat frame shows 2 mounting holes are used per side on the rear cushion and the 140's frame shows using only one hole per side. I'm guessing the rear seat cushion always had 4 mounting holes in it, but was used in both applications. I can understand why using 4 bolts to mount the cushion is better than just two, as in my seat the threaded inserts have broken off inside the back of the cushion. With only 2 bolts the cushion can rock when you lean on it with your back, eventually breaking what's catching the bolts in the seat back. With 4 mounting bolts it would be more stable. Weird thing is the early 140's seem to have the 4 bolt mount and the later ones have the 2 hole mount..........sort of the opposite of learning from your mistakes. So not sure why they changed the 140 to only using 2 bolts to mount the cushion.......maybe the manufacturer of the frame changed the design? I'll make a 2 into 1 adapter plate to mount my new cushion with all 4 bolts to my frame with 2 bolts, but am curious if anyone was aware of this seat frame difference? Good catch Bob. I've noticed that before too but never really thought much more about it. Didn't figured it mattered much. 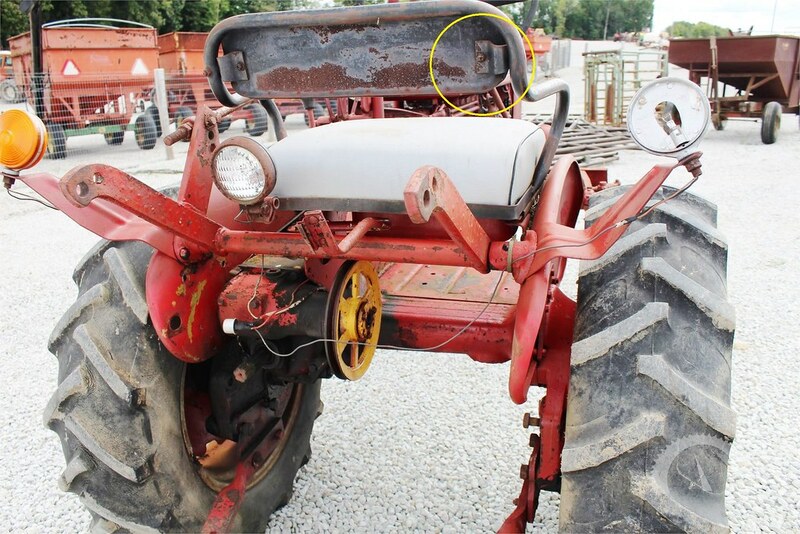 My theory is that since that seat frame was made for IH from 1954 to 1979 (and made for other tractor brands such as John Deere), most likely there was more than 1 manufacturer making the seat frames. I only caught it because the cushion on the 140 I just bought was hanging on by a bolt thread and needed to be replaced. When I looked in the parts manual the seat back cushion pictured was different from my cushion in that the parts book one had a bunch of rivets around the side of the vinyl and my cushion just looked like the one in the first pic above with a backside piece of vinyl stapled around the edge. When I looked at the back of mine a little closer I saw there were another set of holes on each side where the frame tabs mount. So I figured my cushion was a replacement and fit a couple of seat types. I just ordered a new replacement seat back with the rivets around the outer back, like in the parts book.......fully expecting it to only have 2 mounting holes in the back........but it actually has 8 holes! Besides the two on each side we're talking about here there is another set of 4 holes (2 on each side) inboard from the holes we use. So I'm guessing this seat back that I just got can fit even more seats. I know on the vendor who I got this pad from's website it was also listed as fitting a John Deere seat.......so I think you're right that the deluxe seat was also used on Deere tractors as well. 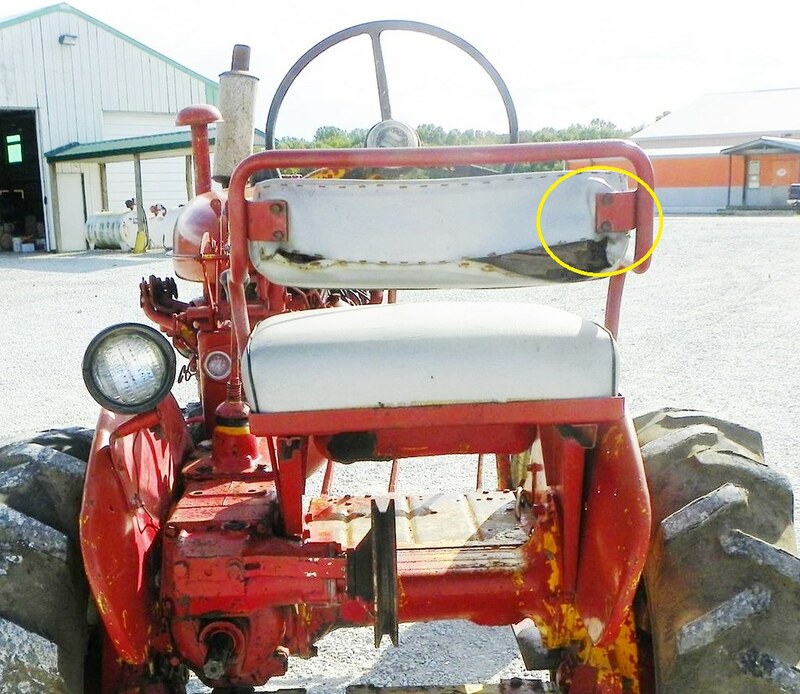 I went to make 2 to 1 hole adapters plates so I could use all 4 holes to mount the cushion on my tractor, but the width of the seat frame tab is wider than the distance between the two holes........so an adapter won't work. Will just have to use 2 holes to mount it and hope it lasts.